A rich, skin-rehabilitative treatment, Aurelia Probiotic Skincare’s Firm & Revitalise Body Oil works in synergy with skin’s own repair and renewal processes – accelerating cellular regeneration with a powerful blend of 100% pure BioOrganic plant and flower essences. A silky, delicately scented elixir, this replenishing oil is almost instantly absorbed – infusing skin with precious moisture and a cocktail of conditioning nutrients – so that you soon look dewy-skinned and radiant from tête to pied. With Kalahari oil (a source of skin-essential fatty acids), alongside Mongongo, macadamia, kukui and borage oils to restructure, regenerate, firm and tone, this instantly quenches skin’s thirst whilst fortifying its protective barrier to keep the ‘good stuff’ in, and ‘bad stuff’ (such as ageing free radicals and pollutants) out. The perfect follow up to a long and relaxing bath, just massage a few drops all over still-damp skin to seal in moisture – or apply to directly to dry skin (limbs, shoulders and collarbones) to grant an immediate, radiant glow. It’s also brilliant post-shaving – to calm irritation and leave your legs velvety soft. An intensive, replenishing top-to-toe dry oil, Firm & Revitalise Body Oil sinks in almost instantly to infuse every inch of skin with much-needed moisture, and swiftly dispel scales and dullness. Soothing and stress-relieving, the fragrant blend of essential extracts makes this a relaxing final step in your cleansing ritual (ideal post-bath and pre-bed) – calming anxieties to ease you towards sleep – and ‘feeding’ your skin with the vitamins and nutrients it needs to recapture its youthful strength, elasticity and resilience. Starring neroli (to quell worries), lavender (to calm and comfort), rose (to protect and condition) and mandarin (to uplift), no bathroom cabinet should be without this gorgeous, healing and balancing potion. And like all things Aurelia, this is completely free from synthetic fragrances, parabens, mineral oils, silicones, sulphates, propylene glycol, phthalates, GMO, PEGs, TEA and DEA – and is certified ‘Cruelty Free’. Dispense the oil into your palm and massage into your body. 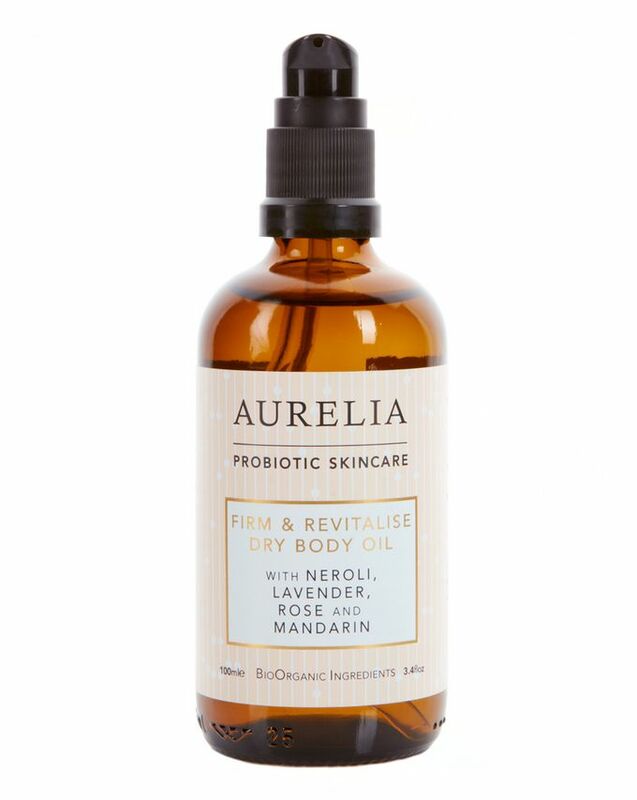 We recommend that the Firm & Revitalise Dry Body Oil is used in a number of ways: To lock in moisture: Apply after a shower or bath when the skin is still damp to help lock in moisture and intensify the effects of the oil blend. For a radiant glow: Use directly onto dry skin to achieve an instant radiant glow. For an aromatherapeutic experience: Apply before a shower or bath to allow the relaxing essential oils to permeate in the heat. For supercharged hydration: Blend with your body moisturiser for supercharged hydration. To soften skin: Use after hair removal to soften and smooth skin. This is my favourite summer oil. It smells of neroli, it’s light and it absorbs quickly. I use it on wet skin after the shower and this way I don’t need much product - a little goes a long way. In the winter I switch to a more nourishing alternative - Kahina Fez Body Oil. This really is a nice dry oil which feeds my skin for a long time. Gets rid of flakiness. But the sent is so not my thing. It reminds me of a bodyshop bath pearl from years and years ago. It gives me a headache. Such a shame. Scent lingers on for a very long time. Which would be a plus if it was your kind of scent. This oil made my Skin super soft, I always put it in the night, because it has a strong scent and I think it would not match with my perfume. This oil leaves my skin just glowing. It never looked better and the scent is just heavenly. I wish it would come in a bigger bottle (and a little cheaper) so I could soak my skin in it, if it is particularly in need. I tried this oil at a department store counter a bit by chance. And I was quite impressed when hours later the skin in my forearms kept of feeling so soft and nicely scented. I remembered that Cult Beauty stocks this brand and ordered the product when back home. I tend to use it at night on both arms and legs and I find it so nourishing and hydrating that it has become a daily routine I am looking forward to. A fabulous purchase.